Refer friends and get $50 after they become our clients! We offer an additional opportunity for our customers to earn by referring friends. You receive $50 (with the possibility to withdraw money from Referral balance) for each referrer, that spends $100 on our services. Go to Referral program's section and choose method for attracting referrers. If you don't withdraw funds from Referral Balance, the figure will always be increased by 30%, starting with those $50. For instance, earned $100 converts into $130; earned $500 into $650. The number of people you can refer is endless. Thus there is no limit in money that you may earn. A simple formula: at least 1% of referrers converts into clients. Consequently, each 1000 referrers bring you $500. After spending funds for more than $100, referrer receives $50 as a bonus, yet for buying links only (he cannot withdraw them). Bonus ($50) can only be paid for a client whose friend has already upload $100 on his/her own LinksManagement account. The $50 bonus will be paid after 45 days after spending funds ($100) by referral. To participate in the Referral Program you must be a valid LinksManagement Account Holder who have the legal right to provide the personal information (e.g., name and email address) of each Referred person. who already have good results. For more detailed information read full Referral Program description or Contact us directly. Installing the banner is one of the easiest way to earn money by referring people. If your site has a lot of traffic, banner installation will bring you $1,000-$3,000 or even more passive income per month. You get paid $50 each time someone you've referred adds $100 to LinksManagement account. Install the banner once and get paid many times afterwards. to place the banner once and you will get benefit from it many times after banner installation. There is no need to refresh or repost it, as it is usually needed in promoting something on social networks. Blow up the forums with the bright offer to sign up to LinksManagement and get $50 to boost sites’ rankings, using a high quality contextual links, guaranteed. that is already prepared for you, and make a post in there. For your convenience we placed the most popular SEO forums on top of the list. You can put a tick in front of forum, where you've posted your link. and post it on the forums. 3. 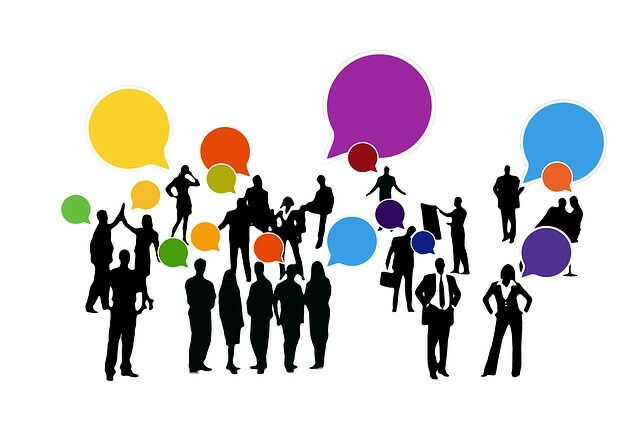 The most original and effective way: post different messages on each forum that you can find to refer as many people as possible. There is no limit to the amount of posts and forums, where you can share your link (http://cp.linksmanagement.com/view/referral#link), as there is no limit to your earned money. The most of sites owners are interested in boosting site rankings and increasing sites’ visibility, so you can post the text not only on SEO forums, but also on the other forums you can find. Post referral messages several times each week or more often to multiply your earnings by attracting as many people as possible to LinksManagement. In your account in LinksManagement you can also download the list of the SEO forums or find your own. Participation in LinksManagement referral program is one of the easiest and safest ways for having additional income. Fast It takes seconds to share the referral link. Just list your friends’ e-mails and click ‘Send’ button to start earning money. Easy You can post the referral links in social networks just in few clicks, and share it on your website or send it through email. Safe You will get incomes even if your referred friend buys links 10 years later after signing up, as all registered referrals will be saved forever. Sign Up Here And Start Earning Now! We hope you made it! In case you have any questions about referral program or other our services, feel free to ask! Want to Try Link Building Services And Get $10 Bonus on Backlinks Purchase? Participate in Special Offer from our company! Our client tells about his experience in taking part in referral program. * Refer as many people as you like. * Your friend will get a reward too. * We offer ready creatives to be placed on forums, social media, email and website. More people you invite, more money you will get. $500 for 10 referrals, $5000 for 100 and so on. With our creatives you'll be able to start earning on the registration day. Looking for additional income? 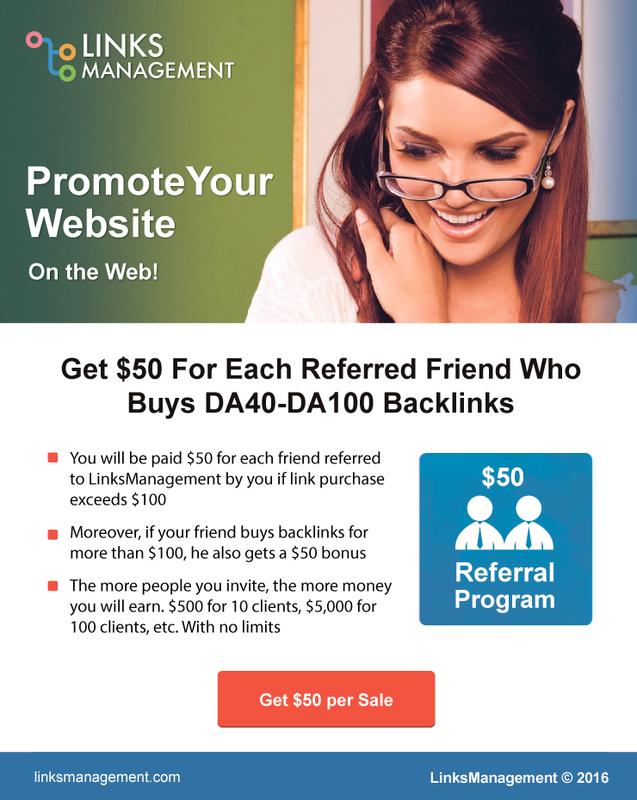 Try this Program and get $50 for each referred friend who buys backlinks. While the others consider the best way of additional income, you may START EARNING by registering in our referral program. The more people you refer, the more money you get. You will get a $50 reward for each of them. You will increase your earnings quickly, easily and safely by using a simple and user-friendly interface with many options to refer friends. It takes 30 seconds to sign up. Try it now! Why You Will Want to Participate in Our Referral Program? That's the real thing you will regret if not sign up! You get $50 and your friend gets $50 too! The more people you invite, the more money you will earn. No quantity restrictions. These are the terms of Referral Program you can be a part of. Every week we stumble upon mentions of our company in social media. They are all about referral links and most of them come from twitter and Facebook. Currently we offer ready creatives for sharing referral links via email, LinkedIn, Facebook, Twitter, banner or skype. Tell us which channel for sharing a referral link is convenient for you? Wanna to have a closer look at our referral program terms? The more people you refer, the more money you get. You will get a $50 reward for each of them. $50 for you and $50 for him! Let's do math. You get $500 for 10 people, $5,000 for 100, etc. With no limits. You will increase your earnings quickly, easily and safely by using simple and user-friendly interface with many options to refer friends. How to get additional income with your friends? Sign up for referral program and earn for each friend you refer. $50 for you and $50 for him! That's really amazing! The more people you invite, the more money you will earn.